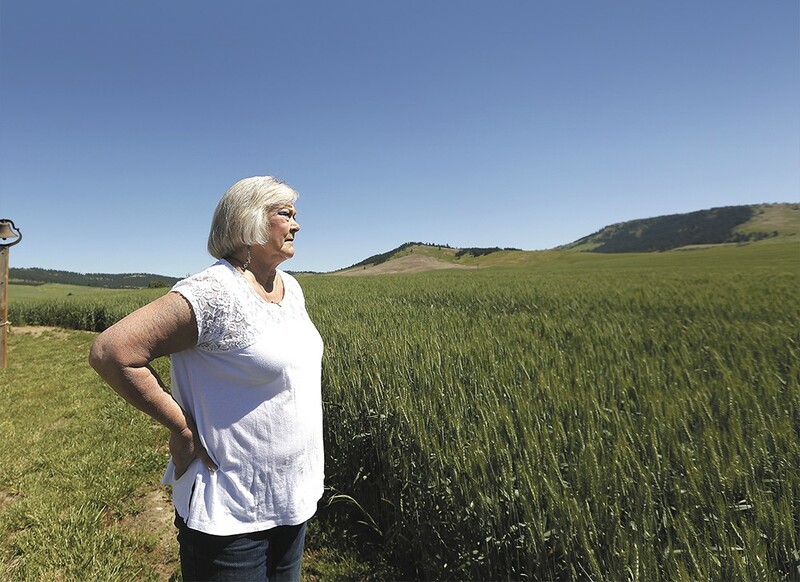 Penney Tee looks over wheat growing onher land outside of Latah. The rule is well known: On weekday mornings, whichever old-timer arrives first at the workshop next to the fuel pumps on the edge of town makes the coffee. Sometime around 9, the other guys start to show up and take their seats in mix-and-match folding chairs set around two long tables, sipping Folgers from styrofoam cups, the whiff of gasoline fumes in the air. Some drive their farm rigs into Latah, tucked in the fertile hills of the Palouse about 40 miles south of Spokane. Others arrive in their trucks. On Monday, it doesn't take long before the ribbing begins (more polite than usual with ladies in the room), and stories start to flow between the handful of farmers and retirees. "Glenn is so old that he went to school in a town that there isn't even a town there anymore," explains Larry Tee with a smile. "Now repeat that for the hard of hearing?" Glenn Leitz responds, genuinely asking Tee to speak up. Leitz recalls going to a four-room schoolhouse in a once-nearby town called Spring Valley for his early education. "The foundation is still there today," he explains. "Other than the grain tanks, that's the only reminder there was ever a town there." Though there are plenty of buildings standing in Latah, it's not clear if the town of about 195 souls is headed in the same direction. At least one of the essentially volunteer town councilmembers has asked if the town should dissolve. When Latah was incorporated as a town 125 years ago, the first families settling in the area had already set to work establishing the framework of a thriving community. By the early 1900s, there was a shoe store, a drug store, a jewelry store, two blacksmiths, churches, a school, two hotels and grocery stores, and trains passed through every day. Tee's dad, born in 1919, used to talk about how busy the town was while he was growing up. "They'd have the big harvest crews in for harvest. Everybody would come into town on a Saturday night, and you couldn't even hardly walk on the sidewalk, it was so crowded," Tee says. "You still can't, because the bushes are all grown over," jokes Tom Pottratz, who runs a lentil and grain processing facility in town. Over the years, the farms in the area consolidated as the town shrunk. "There used to be a family on every 160 acres," Tee says. "They would make a living and raise a family on that acreage. Now if you don't have two, three thousand acres, it doesn't even hardly count." There's no restaurant, or other real gathering place in town anymore. The cafe the men used to meet at closed about a decade ago. With no remaining newspaper in the area, this is how they get their news. Latah Councilman Steve Leitz and his wife Laurie aren't sure the town should stay incorporated. 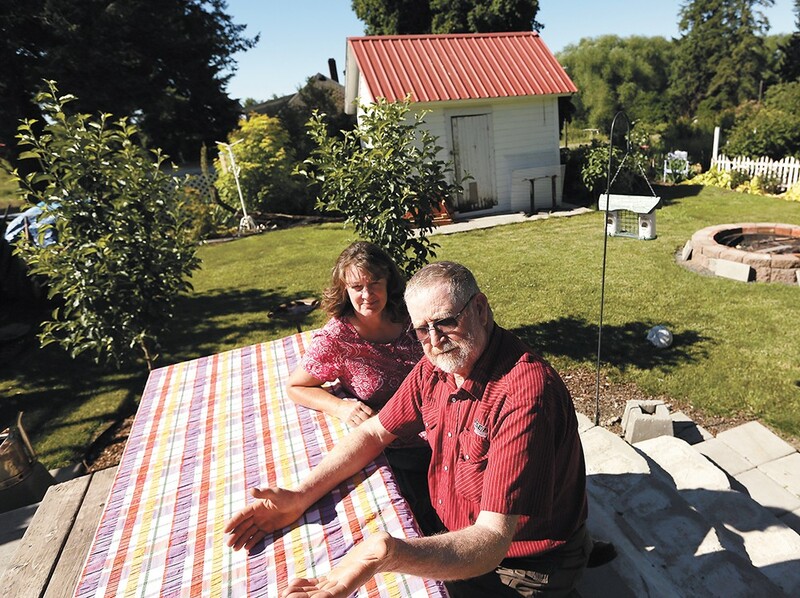 "These smaller towns, with the advent of bigger farms, they've kind of dried up, really," says Penney Tee, who with her husband Ron Tee runs one of the two farm operations left in the valley. The fifth-generation farmers, who live just outside of Latah, rent about two-thirds of the 5,000 acres they farm. It's a small operation, with just Ron, their son Jeff, and a few hired hands to drive truck during harvest. "A lot of families in this area grew up, kids moved away, went to college and got different jobs," Penney explains. "Jobs that paid better than 2 percent on your investment. So they either sold or they rented it." Where winter wheat, lentils, and peas used to be on a 3-year rotation, they've now diversified. They grow barley — "beer drinkers rejoice" — other varieties of wheat, Kentucky bluegrass, and garbanzo beans, because "about six years ago the world discovered hummus," Penney says. "Some of it's steeper than a cow's face." With changes in farming, the area has changed drastically. Where there were once thriving granges to host dances and events, towns like Latah now have a hard time finding volunteers to host events, as just a few people take on the bulk of the work. A reader board in front of the combination town office/fire station/community center informs people that because no one filed to run for mayor, or for the four of five council positions that are up for election this year, there will be a special filing period in August. That's not necessarily unusual, explains Councilman Larry La Bolle, who lives with his wife Lisa La Bolle in a Victorian home they've worked to restore. Larry La Bolle was first elected to fill the remainder of a council term that was half over, but didn't realize that at the time, so when he came into town one day and saw the reader board said "council position number two, special registration," he called the town clerk and asked what that was all about. "She said, 'That's you! You didn't register to get on the ballot,'" he says. "It's pretty laid back. No one else had registered either, or else it would have closed." In 2013, a game of chance decided the fate of a council election in Latah, when votes were tied 41-41 for two candidates. The Spokane County Auditor chose to put two marble-sized balls in a bottle, the Spokesman-Review reported, and the first one out when it was tipped over decided who the position went to. Councilman Steve Leitz, who lives with his wife Laurie near the eastern edge of Latah, says he's floated the idea that the town should dissolve. "Is it really worth being a town? Should we unincorporate and let the county manage the town? The county would take over the streets and plowing," Leitz says. "Basically, on the council we're a group of people who listen to the complaints of people against their neighbors, and it's really unfair. It's petty stuff." There are a lot of complaints about people letting dogs poop in their neighbor's yard, or not keeping their dogs under control. "In a town this size, you wind up being referee," he says. "I kinda think that a town this size is not in the best interest of the taxpayers." The town operates a water system, but there is no sewer, so everyone is on septic systems. Street and sidewalk projects and environmental and urban planning are usually paid for with help from grants. But the La Bolles and several other Latah residents wholeheartedly disagree with the idea of dissolving the town. If the county were to take over control, they'd go from having six representatives they personally know to having a three-member commission in Spokane run things. They're happy with the county's help at the level it is now, but want to maintain some local control. "I don't know if the county in the winter would plow our streets the way we do," Lisa La Bolle says. "We make sure every citizen can get in and out of his driveway. I imagine they'll just focus on the big roads." And the town still has its draw for people who enjoy restoring historic buildings and the quiet country life. Drive in on the Palouse Scenic Byway, and one of the first buildings you'll see is a white hotel that retirees Carole and Rick Meissner have restored and turned into their home over the past several years. To refill the coffers as they take on different restoration projects, they run an antique store, The Red Barn, on a corner of their property. "It's a quiet, slow-moving town with no streetlights," Carole says. Cellphones don't work here, and for most people, that's OK. For those who still work, it's a commuter town. Most everyone buys their groceries in Spokane. As for the open council positions, if no one says they'll run soon, Larry La Bolle says he'll handwrite letters to try to convince someone to take on the work. Metaline Falls' Cutter Theatre is a long-time point of community pride, but can the arts in rural Washington thrive in the digital age?